Damiel (Bruno Ganz) and Cassiel (Otto Sander) are angels who spend their days roaming Berlin before the fall of the Wall eavesdropping on the conversations of ordinary folk. While slow to start and void of plot as traditionally understood, patience is rewarded in viewing what is really a combination of poetry and stream of consciousness brought to film by director Wim Wenders. 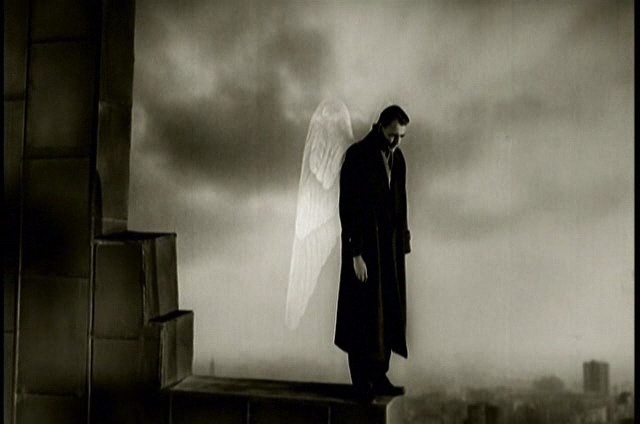 Wings of Desire is deep on umpteen levels and full of messages that still ring true today: who are you? why are you here? is love worth it? When Damiel falls in love with the beautiful trapeze artist Marion (Solveig Dommatin) and opts to fall from grace, we have an answer as sure as the truths espoused by Peter Falk (playing himself). This is a beautiful film and an artsy film, sure; but in the end isn't it better you be challenged to see yourself differently upon leaving a movie theatre?